The 9th Conference of the International Coenzyme Q10 Association was held June 21 – 24 in the Faculty House at Columbia University in New York. Researchers from many different countries and continents attended. 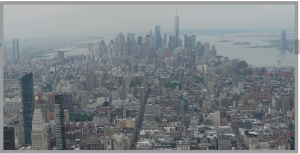 What did the leading Coenzyme Q10 researchers have to say in New York? Coenzyme Q10 has three primary fields of activity in the body: as a co-factor in the energy production process in the cells, as a fat-soluble antioxidant protecting cells against oxidative damage, and as a regulator of endothelial function. In addition, Coenzyme Q10 has anti-inflammatory properties and plays a role in proper cell signaling activity. The most recently published data from the KiSel-10 study done in Sweden shows that the beneficial heart health effects of supplementation of elderly live-at-home individuals with a combination of Coenzyme Q10 and high-selenium yeast have persisted through year 12. A bio-availability study done at a university in Spain shows that the formulation of the Coenzyme Q10 supplement is even more important than the form of the supplement. The absorption of a well-formulated ubiquinone Coenzyme Q10 supplement is better than the absorption of a ubiquinol supplement. A sub-group analysis of the data from the Q-Symbio study of the effect of adjunctive Coenzyme Q10 treatment on European chronic heart failure patients shows even better results for Europeans than for all patients in the multi-center study. Studies show that there may be interactions between Coenzyme Q10 and other nutritional supplements, meaning that we should be careful not to take these supplements at the same time we take our Coenzyme Q10. The consensus at the conference was that the therapeutic level of Coenzyme Q10 in the plasma or serum is somewhere between 2.5 and 3.5 micrograms per milliliter. Above 4.0 micrograms per milliliter, the beneficial effect of Coenzyme Q10 supplementation is thought to flatten out. Statin medications only deprive the body of Coenzyme Q10 by inhibiting the bio-synthesis of Coenzyme Q10 just as they inhibit the bio-synthesis of cholesterol. Now there is evidence that long-term use of statins has undesirable effects on cognitive function and on memory in particular. The statins easily cross the blood-brain barrier and adversely affect the protective myelin sheaths in which cholesterol is a key component. More about these topics below. Every three years, the International Coenzyme Q10 Association (ICQA) holds a conference at which researchers from around the world present their research findings related to Coenzyme Q10. This year, the conference was held at Columbia University in New York the 21st-24th of June. Many of the presentations and papers concerned the biochemistry of Coenzyme Q10’s effects. In this article, I want to focus in on the presentations of results from human clinical studies. In the clinical area, the emphasis was demonstrating the importance of Coenzyme Q10 supplementation to heart health, healthy ageing, and better quality of life. 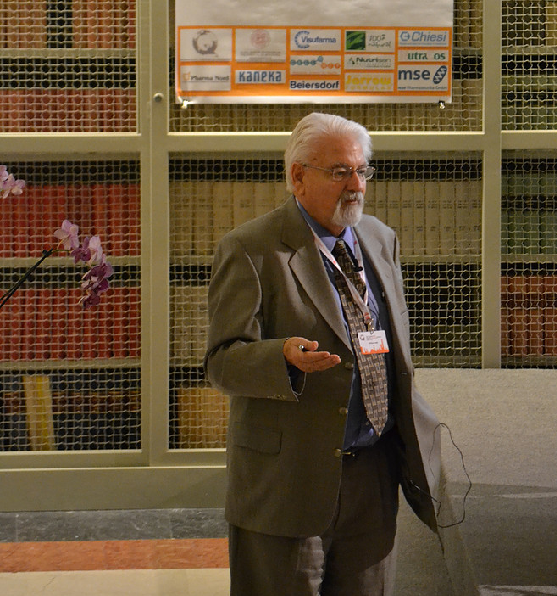 Professor Guillermo Lopez-Lluch listens to a comment from Professor Gian Paolo Littarru. Professor Guillermo López-Lluch and a research team in Spain tested seven formulations containing 100 milligrams of Coenzyme Q10 on each of 14 study participants in a double-blinded cross-over trial with a washout period of 14 days in between each test. There were six ubiquinone Coenzyme Q10 formulations and and one ubiquinol supplement among the tested preparations. The experiment showed that the absorption of Pharma Nord’s Myoqinon – a ubiquinone Coenzyme Q10 preparation – was significantly better than the absorption of any of the other preparations. Some preparations showed low or no absorption. The big take-away from the López-Lluch study is that the study shows that the formulation of the raw material Coenzyme Q10 in the supplement is even more important than the form of the Coenzyme Q10: the ubiquinone form or the ubiquinol form. Coenzyme Q10 as a raw material is notoriously difficult to formulate in a way that promotes better absorption, bio-availability, and efficacy. This is the first head-to-head comparison of a well-formulated ubiquinone Coenzyme Q10 supplement and a well-formulated ubiquinol supplement. The study results leave no doubt that the ubiquinone Coenzyme Q10 supplement – the same one used in the Q-Symbio study, the KiSel-10 study, and the Gulf War Illness study – has a superior formulation and superior absorption. 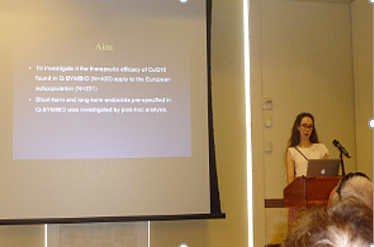 Bio-chemist Anne Louise Mortensen presents the findings from the European sub-group analysis of the Q-Symbio study. In the original international multi-center Q-Symbio study, 420 chronic heart failure patients from nine countries were enrolled and randomly assigned to Coenzyme Q10 active treatment or to placebo treatment. At the conference in New York, the Danish bio-chemist Anne Louise Mortensen presented data from a European sub-group of 231 patients from Denmark, Sweden, Austria, Slovakia, Poland and Hungary. She excluded data from patients from Asia and Australia. In her sub-study, the CoQ10 active treatment group consisted of 108 patients who received the Myoqinon Coenzyme Q10 in 100 milligrams doses three time daily. The placebo group with very similar represented was composed of 123 patients. Dr. Mortensen’s analysis showed an even better effect of the Coenzyme Q10 adjunctive treatment on the European part of the patient group. Why were there significantly better results in the European sub-group? One reason may be more conscientious compliance with taking the medication during the entire two-year study. Another reason may be that the European patients formed a more homogeneous group than the entire original Q-Symbio group. At the conference, Dr. Peter Langsjoen presented evidence that relatively high doses of Vitamin E can inhibit the effect of Coenzyme Q10 supplements. Dr. Langsjoen’s results suggest that we should take no more than 300 international units of Vitamin E daily if we want the full effect of the Coenzyme Q10 supplement. A Ph.D. student showed that supplementation with PABA results in a 50% reduction of cellular Coenzyme Q10 compared to the controls taking no PABA. PABA is a vitamin B-like substance. It used to be called Vitamin B-10. It is being used as a dietary supplement. So be alert for it. Dr. William V. Judy, founder and president of the SIBR Research Institute, has worked in basic and clinical research for nearly 50 years, focusing in great part on the absorption and therapeutic effects of Coenzyme Q10. Studies show that it is okay to take Vitamin C and Coenzyme Q10 on a daily basis. However, when I talked with Dr. William Judy, President of the SIBR Research Institute, about this topic, he said not to take Vitamin C within an hour of having taken the Coenzyme Q10 capsule. It is not a good idea to take a supplement that combines Coenzyme Q10 and Vitamin C.
Bhagavan and Chopra  estimated the reference interval for plasma Coenzyme Q10 to be between 0.35 and 1.65 micrograms per milliliter of plasma. Let’s say that we healthy individuals — unsupplemented — usually have a level of Coenzyme Q10 in the blood close to 1.0 milligram per liter. Dr. Svend Aage Mortensen, the lead researcher on the Q-Symbio study, thought that supplementation has to lift the level of Coenzyme Q10 in the blood to at least 2.5 micrograms per milliliter to achieve a sufficient therapeutic effect. Today, many researchers regard 3.5 micrograms per milliliter as the desirable level. 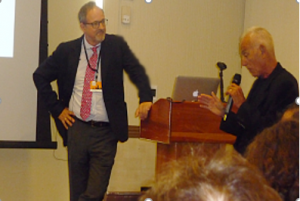 At the conference in New York, Dr. Peter Langsjoen indicated that there is usually no therapeutic benefit from raising the level of Coenzyme Q10 in the blood higher than 4 micrograms per milliliter. Professor Guillermo López-Lluch explained that many ageing-related diseases involve neuro-degeneration, loss of muscle mass, osteoporosis, metabolic disease, insulin resistance and decreased immune response. In many of these diseases, mitochondrial dysfunction and oxidative stress and chronic low-grade inflammation are observed. These symptoms are associated with decreased levels of Coenzyme Q10 in the body. As we age, we bio-synthesize less and less Coenzyme Q10, also in the brain. Only a small amount of supplemental Coenzyme Q10 crosses the blood-brain barrier. One of the problems with neuro-degenerative diseases such as dementia and Parkinson’s disease is the small amount of supplemental Coenzyme Q10 that is able to reach the brain. It may be that gram doses (1200-2400 milligrams per day) are needed to get supplemental Coenzyme Q10 to the brain cells. Conclusion: Supplementation of low-selenium-status elderly individuals with a combination of Coenzyme Q10 and selenium is an effective anti-ageing prescription. Approximately nine percent of the world’s population suffers from diabetes – mostly type II diabetes. Consequently, the board of directors of the International Coenzyme Q10 Association has decided that the next Coenzyme Q10 conference will focus on Coenzyme Q10’s effect on diabetes. Dr. Franklin Rosenfeldt presented evidence from a meta-analysis showing that statin medications – which reduce the body’s production of Coenzyme Q10 as well as its production of cholesterol – inevitably have an adverse effect on cognitive function and on memory in particular when taken for long periods. It seems that the statin medications not only reduce the body’s endogenous Coenzyme Q10 production that protects against brain damage caused by free radicals. The statin medications also adversely affect the protective myelin sheaths in which cholesterol is a key component. Coenzyme Q10 is arguably the single most important nutritional supplement we can take. The formulation of the Coenzyme Q10 supplement is super important for absorption and health effects. It is not necessary to take a ubiquinol supplement – instead of a good ubiquinone Coenzyme Q10 supplement – to get antioxidant protection. Disclaimer: the information presented in this article is not intended as medical advice and should not be construed as such. Please click here for additional information about the heart health benefits of Coenzyme Q10 supplementation.